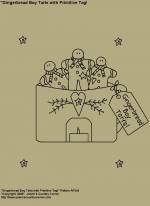 #A044-1 Primitive Stitchery E-Pattern "Christmas Carol Snowman!" 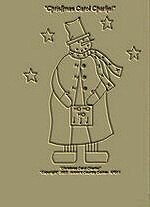 Primitive Stitchery Pattern Snowman"Christmas Carol Charlie!" #A047 Primitive Stitchery E-Pattern "Catch a Falling Star!" 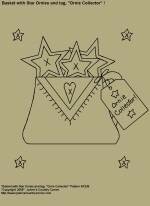 Primitive Stitchery Pattern "Catch A Falling Star!" #A048-1 Primitive Stitchery E-Pattern " Believe In Angels!" 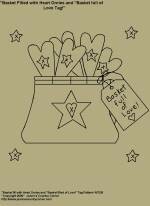 Primitive Stitchery Pattern, "Believe In Angels!" #A095 Primitive Stitchery E-Pattern, Prim "Stars and Stripes forever!" "Stars and Stripes forever!" AP051 Primitive Stitchery Pattern measures 5 1/4" x 5 3/4". #A161 Primitive Stitchery E-Pattern "Primitive Sheep'n Stars Shelf Scarf Pattern!" Primitive Stitchery Pattern "Primitive Sheep'n Stars Shelf Scarf Pattern!" 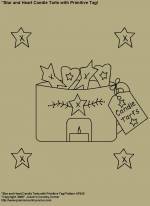 This shelf scarf pattern can be used to decorate shelves, for candle mats, or to line baskets. Measures 5 3/4" x 7 7/8". For larger shelves, you can place more than one Shelf Scarf at side by side of each other! #A172 Primitive Stitchery E-Pattern "Stars and Moon Snowman!" Shelf Scarf Pattern! 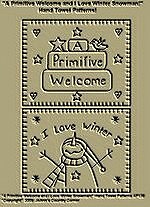 #A201-1 Primitive Stitchery E-Patterns "A Primitive Welcome and I Love Winter Snowman!" Hand Towel Patterns! 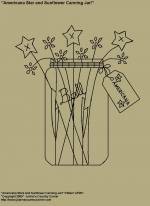 Primitive Stitchery Patterns, Set of 2, Fast and Easy To Stitch, Hand Towel Patterns. " A Primitive Welcome and I Love Winter Snowman!" Hand Towel Patterns! Please click on picture to see finished Hand Towel Stitched by JoAnn which is available for purchase. Primitive Stitchery E-Pattern, "Gingerbread Boy Tarts with Primitive Tag "Gingerbread Boy Tarts!" Measures 6 3/4" x 5 3/4". Primitive Stitchery E-Pattern, "Star and Heart Candle Tart Holder with Star and Heart Tarts and Primitive Tag, "Candle Tarts". Measures 5 7/8"x 7 3/8". 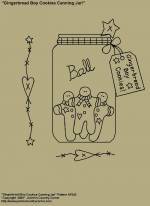 Primitive Stitchery E-Pattern, "Gingerbread Boy Cookies Canning Jar and Primitive Tag, "Gingerbread Boy Cookies!". Measures�6 3/8"x 7 1/2". 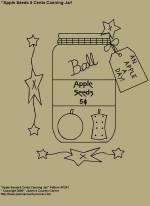 Primitive Stitchery E-Pattern, "Apple Seeds 5 Cents Canning Jar�and Primitive Tag, "An Apple A Day!". 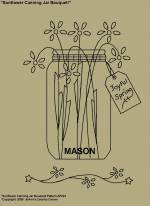 Measures�6 1/2"x 7 7/8". Primitive Stitchery E-Pattern "Watermelon Seeds 5 Cents Canning Jar with Primitive Tag, "Watermelon Seeds 5 Cents!" Measures 6 1/2"x 7 3/4". Primitive Stitchery E-Pattern, "Basket with Star Ornies and Primitive Tag, "Ornie Collector!" Measures 7 1/4" x 7 1/8"
Primitive Stitchery E-Pattern, "Basket with�Heart Ornies and Primitive Tag, "Basket full of love!" 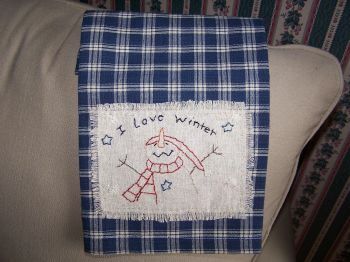 Measures 7 1/4" x 7 1/2"
Primitive Stitchery E-Pattern, "I love snowmen! 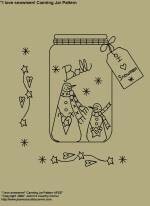 Canning Jar E-Pattern with Primitive Tag " love Snowmen". Measures 6 1/2" x 7". 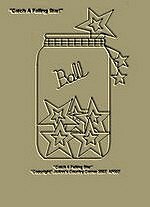 #A348 Primitive Stitchery E-Pattern, "Americana Star and Sunflower Canning Jar with Primitive Tag!" 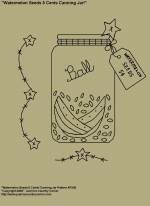 Primitive Stitchery E-Pattern, "Americana Star and Sunflower Canning Jar with Primitive Tag," Americana"! Measures 6 1/2" x 7". 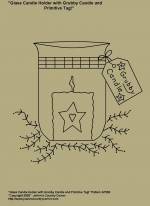 #A349 Primitive Stitchery E-Pattern, "Glass Candle Holder with Grubby Candle and Primitive Tag" Grubby Candle!" �Measures 6 1/4" x 6 3/4". 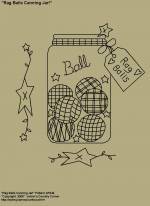 #A350 Primitive Stitchery E-Pattern, "Rag Ball Canning Jar with Primitive Tag,"Rag Balls". Measures 6 3/4" x 7 1/2".